Until today, my only experience with arancini, or Italian fried rice balls, was on cocktail party platters. I never found them very delicious and wondered what the appeal was. 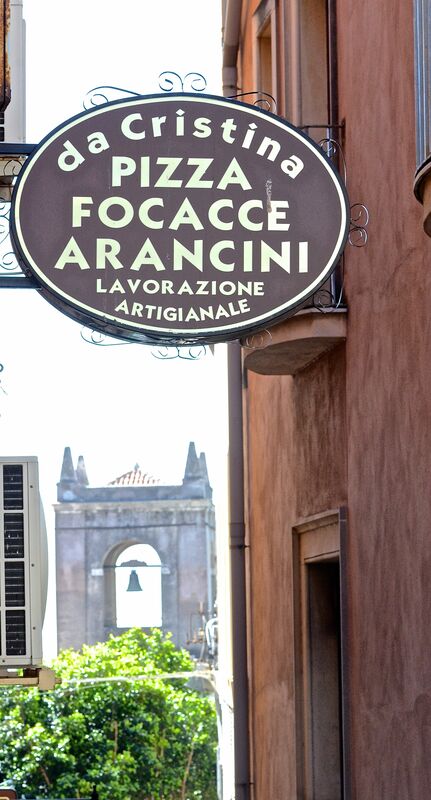 On my trip around Sicily this week, arancini was on my list of foods I wanted to try in the true Italian way. When I saw the sign for this simple eatery, Da Christina, I told Allan that this was to be our lunch. Upon entering, the food clearly looked authentic and delicious, but as we waited for some pizza and arancini to be heated and fried, we became mesmerized by the women who work this joint. Christina, pictured above, is the lead. She is kind, and bubbly, and coaxed us through ordering what we wanted. She works with another woman, her same age, and a much older woman who looks to be a mother. The older woman stood and formed up pizzas, and calzones, and focaccias one after another. The three women had a quiet, knowing rhythm between them that was like ballet to watch. They didn’t talk much to each other; they just moved in an interwoven pattern, pulling pizzas out of the ovens, waiting on customers, forming up arancini. The food was fantastic. I am now haunted by arancini and must try to learn to make what they made; ours was filled with manchego cheese and pistachios. We floated away knowing we had eaten special food made by the hands of some Sicilian experts. It wasn’t until we finished eating that we read the New York Times review of this place. They discovered it when they saw someone on the street with an arancini and asked where it had come from. Their review simply confirmed what we had already seen for ourselves. I hope that Giada de Laurentis will provide me with a good starting place recipe. If you have an authentic recipe, please send it my way. 1) Pour enough oil in a heavy large saucepan to reach the depth of 7-cm. Heat the oil over medium heat to 180C. 2) Stir the eggs, risotto, Parmesan, and 60g of the bread crumbs in a large bowl to combine. Place the remaining breadcrumbs in a medium bowl. Using about 2 tbsps of the risotto mixture for each, form the risotto mixture into 3-cm diameter balls. Insert 1 cube of mozzarella into the center of each ball. Roll the balls in the bread crumbs to coat. 3) Working in batches, add the rice balls to the hot ail and cook until brown and heated through, turning them as necessary, about 4 minutes. Using a slotted spoon, transfer the rice balls to paper towels to drain. Season with salt. Let rest 2 minutes. Serve hot. 1) Bring the broth to a simmer in a heavy medium saucepan. Add the porcini mushrooms. Set aside until the mushrooms are tender, about 5 minutes. Keep the broth warm over very low heat. 2) Melt the butter in a heavy large saucepan over medium heat. Add olive oil. Add the onions and saute until tender, about 8 minutes. Add the white mushrooms and garlic. 3) Using a slotted spoon, transfer the porcini mushrooms to a cutting board. Finely chop the mushrooms and add to the saucepan. Saute until the mushrooms are tender and the juices evaporate, about 5 minutes. 4) Stir in the rice and let it toast for a few minutes. Add the wine; cook until the liquid is absorbed, stirring often, about 2 minutes. 5) Add 250ml of hot broth; simmer over medium-low heat until the liquid is absorbed, stirring often, about 3 minutes. Continue to cook until the rice is just tender and the mixture is creamy, adding more broth by cupfuls and stirring often, about 28 minutes (the rice will absorb 6 to 8 cups of broth). 6) Stir in the peas. Mix in the Parmesan. Season with salt and pepper, to taste.